Here are some more of my blocks for our guild charity project. I have 2 more to make by Thursday. I really like both of the pink/green ones here. These are made from some of my larger scraps. 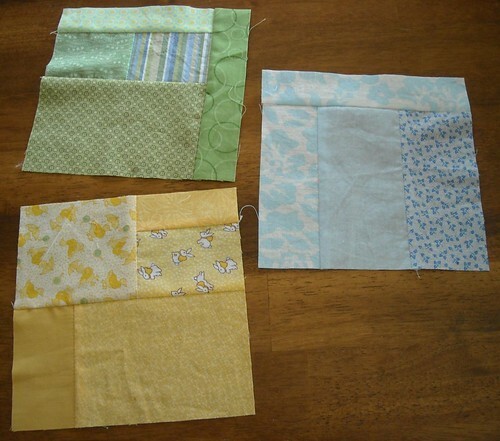 I decided to make them 6.5" square; I think a bunch of these could make a really cool looking quilt. Or maybe a rainbow table runner. I don't know yet. 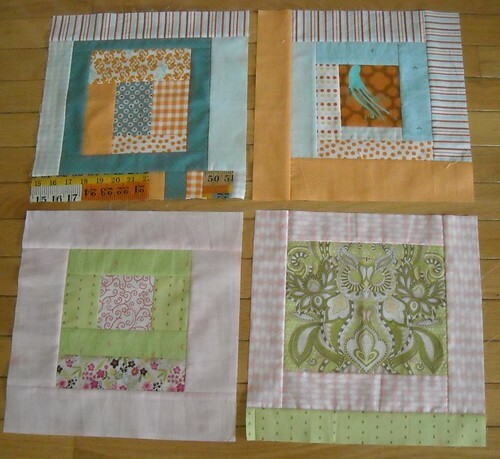 I spent some time today hand quilting while watching Bones, and also cutting 2" squares for my bee beautiful group. I have about 130 green squares added to my collection now. The other two pairs were already in the laundry when I finished all of them up and was ready to take a picture. They fit really loosely until after they were washed and dried the first time, and now the elastic is shrunk up and they fit her just right. The pattern is from Wonderbaby Designs and it's a good one. 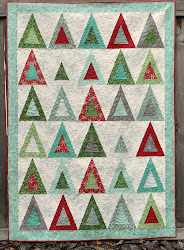 I have also been working on a custom order that involves Heather Ross Mendocino fabrics and diamond piecing. I'm making pillow shams to match ones I made last year... and I didn't save my notes. I'm doing my best to make the new set as similar as possible to the old ones, and I'm writing down my measurements in a notebook that won't get lost or thrown out. It's too hot to cook, again. I'm making breakfast for dinner. Those training pants are just to cool! I love the training pants. I am about to reach the potty training stage again and would love to use these. I clicked on the link and it looks like she only sells the pants already made. Where did you get the pattern and also where do you get the fabric and materials to make them. Ican't wait to see what comes from the leaders and enders project. Looks like your getting alot done, that's always good! THere's something so awesome about log cabin-ish blocks - I love yours! ANd yay breakfast for dinner!